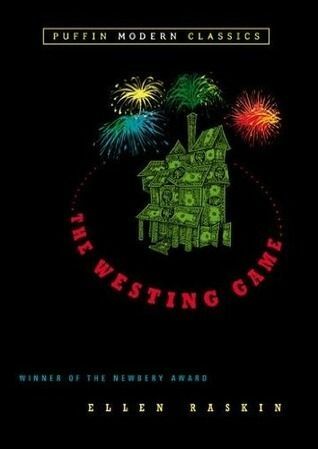 The Westing Game (Ellen Raskin) was one of my first selections for the Newbery Through the Decades 1970s challenge. The concept was so intriguing. Samuel W. Westing, a millionaire has been murdered. Maybe. Sixteen strangers (who happen to live or work in the same apartment building) are brought together for the reading of Westing’s will and are invited to play a game. The game is to find who murdered Samuel W. Westing and the prize is Westing’s vast fortune. This is not your typical murder mystery. The sixteen strangers are paired into teams. We see that each has a story, a connection to Westing, and different struggles. To add to the chaos, a bomber and a thief are tossed into the mix. As you read, you are naturally trying to solve the mystery yourself. You have the benefit of all the clues! But will it be enough? Can you solve the mystery before the sixteen strangers do? An observant reader might just catch a few extra clues here and there that Raskin has weaved into the story. You might even read it twice to see what you missed. I read this book and found it engaging and quirky and fun. Some characters I enjoyed and some I did not; a great range of personalities. Shouldn’t stories be this way? I think I would have enjoyed reading this very much as a child. Though it was not planned, I read this aloud to my children. My children ages nine and up kept notes while I read. Most of them had solved the mystery before we were done. Well, at least part of it. Ha! It will likely not be interesting to the younger crowd. I do think it is best served as an individual read. We needed to get it returned to the library so read aloud it was. Have you read The Westing Game? This is one of those books that I’ve always meant to read, but just haven’t gotten to yet. It sounds really interesting! I should bump it up to the front of my shelf. Thanks for the inspiration!